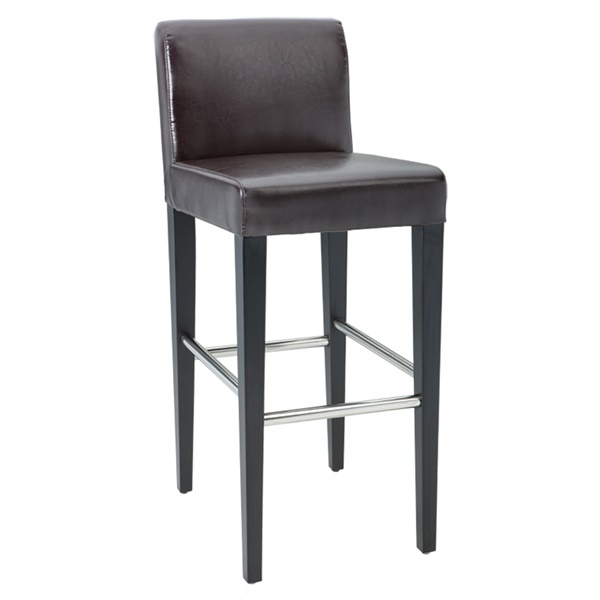 With its simple, yet bold style and clean sense of elegance, the Oriana Bar Stool adds an instant touch of artistry and grace to any bar area. Enjoy drinks, snacks, or a light meal in true upscale style, whether at home or in a restaurant, pub or bar. This stool�s frame and legs are crafted from solid wood for optimum strength and durability, while metal stretchers provide reinforced stability. Generous seat and back cushioning offer premium comfort, while a low back design and a built-in metal footrest provide added support. The Oriana features a matte black frame finish for added sophistication. The seat and back are upholstered in quality bonded leather for a soft, supple and luxurious touch. Available in your choice of upholstery colors.